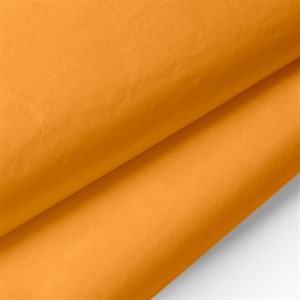 A great quality Orange Coloured ACID FREE & COLOURFAST tissue paper that is ideal for any use. We are now stocking this premium tissue in over 20 colours. We are sure you won't find better value or a wider range of tissue anywhere on the internet! Acid Free and colour-fast tissue paper. Made from 18gsm paper and 100% dyed. Available in a range of convenient pack sizes. Picture is for illustrative purposes only and if the colour or design is important to you then we recommend that you ask for a sample. Commonly used to wrap gift items and in clothing stores. Please note the dye is colourfast and is designed for jewellery, delicate clothing and other items. Our stock of Premium Tissue Paper are acid free and colour fast and we are able to overprint them with your chosen design. A simple 1 colour print from as little as 1000 sheets. If you require something a little more complex please contact our Sales Team and they will be happy to help you.